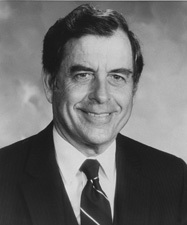 Jeremiah Andrew Denton Jr. (July 15, 1924 – March 28, 2014) was a United States Senator representing Alabama from 1981 to 1987, a Vietnam War Naval aviator, and was promoted to rear admiral in April, 1973. Denton is known for enduring almost eight years of grueling conditions as an American prisoner of war (POW) in North Vietnam after his Grumman A-6 Intruder attack aircraft was shot down July 18, 1965. He was the first of the Hanoi POWs to step off of the American plane during Operation Homecoming celebration on Feb. 12, 1973. Denton's When Hell Was in Session, which describes his captivity, was published in 1976 and was made into a film starring Hal Holbrook in 1979. He was the subject of the 2015 documentary Jeremiah produced by Alabama Public Television. Televised North Vietnam propaganda interview (1966) using his eyes to blink in Morse code, confirming for the first time to the U.S. Office of Naval Intelligence that American POWs were being tortured. We are honored to have had the opportunity to serve our country under difficult circumstances. We are profoundly grateful to our Commander-in-Chief and to our nation for this day. God bless America. We've got to realize that we're in a ball game at a certain juncture, at this point, where we better go back to bipartisanship in looking at foreign policy, be we conservatives or liberals, or Democrats or Republicans, that this country is beginning to lose its footing in the world, not only as a leader, but as a friend, or as a credible enemy. We are being perceived, perhaps somewhat accurately, as a rather paralyzed giant that is ripe to fall off the tree like an over-ripe plum, and fulfill Khrushchev's prophecy, "We will bury you!" He didn't mean overcome us with nuclear weapons. He meant that we, in our sloppy thinking and presumption about not being able to live with prosperity, and not being able to look things in the eye, would simply weaken until our interests were eroded to the point, and our credibility was eroded to the point, that we couldn't stand. "Terrorism and Politics" (June 3, 1985 ) C-SPAN video with audience question & answers, 23:18. We have been in a process of attaining a great degree of luxury, degrees of luxury which distract us... and we are consumed with such matters as wrap-around octophonic sound in our automobiles and so forth, we are becoming quite sophisticated with respect to non-necessities. This has happened to nations in the past, and it is my belief that man can cope with adversity, and that his most difficult problem, is coping with prosperity. I was once in a rig which was inducing considerable pain, and I finally just said... God, you've got it. I can't take it any more. I can't handle it. I'm just putting it entirely in your hands, and from the instant I phrased that... I felt absolutely no pain. In fact, I felt the greatest sense of comfort, not only physical comfort, but psychological warmth and comfort that I have ever felt in my life, before or since. POW interview (1966) video @U.S. National Archives: choose Contents > Scenes From Hell > Denton. This page was last edited on 22 March 2019, at 19:38.